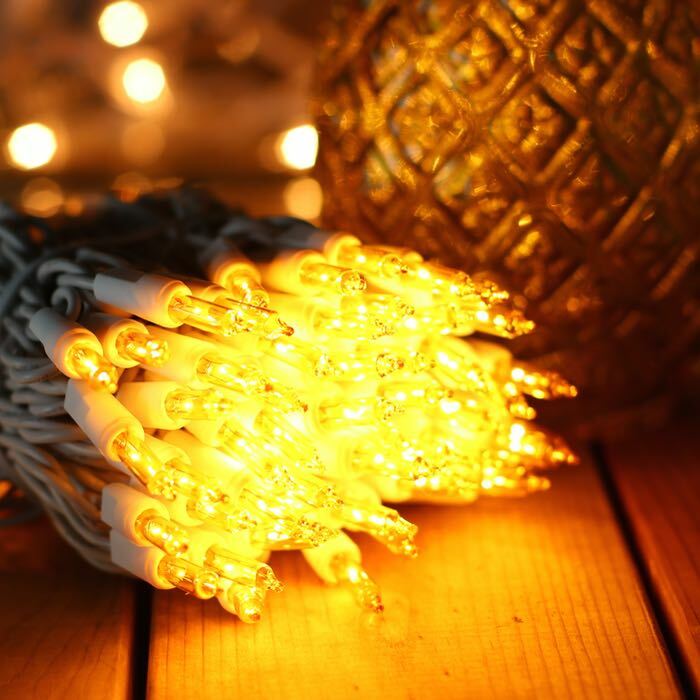 Yellow Christmas light strings are a lovely way to add a golden glow to your vintage Christmas tree or your next party. From under-lighting a bar cart to lighting up a reading nook, these strings are a versatile set of light strings that are great to have on hand all year. Constructed with 100 lights to the string with 2.5-inch spacing, this light string is over approximately 21 feet long and is manufactured with 2.5 inches of wire between the plugs and first lights at the beginning and end of the string. Fitted with a standard male and female plug set, these lights plug into any standard household outlet. You can run up to 5 sets in series for a fantastic 100+ feet of fantastic light. To run more sets, install these strings with a second extension cord or splitter. Q: No question. The product is very good and of high quality. I made a mistake by assuming there were clips on each light for 1/4 inch metal rod. The smaller clips on my previous purchase did NOT support the 1/4 inch rod. Do your recommend twist tags? A: We use twist ties on our projects where the frames are of a non-standard diameter. You might consider tightening down an adjustable wrench on your frame and measuring the gap to confirm that it is or is not a 1/4" frame. Here are all of our sculpture clips that work with standard mini lights strings like these. If your frame is 1/4 inch then one of these clips should work.